The way we teach our children makes a big impression, a lasting one. I don’t remember much about fire drills from elementary school; I remember being in the school plays. By contrast, I remember vividly a different drill in sixth grade: we were told that an air raid siren would go off and that we were to get under our desks with our hands over our heads. Why? I grew up in Houston, TX in the 1980’s. We were told that the Russians had nuclear warheads aimed at NASA which was, in Texas terms, just down the road (about a 45 minute drive). We were taught to be afraid. This week, an arrest was made in the investigation into the recent bomb threats against Jewish institutions, AND my school, Albert Einstein Academy began performances of our spring play, “Disney Winnie the Pooh Kids!” Which do we want our students to remember? The answer should obviously be the play. The arrest provides a bookend in one more volume of the encyclopedia of anti-Semitic attacks. In using the term “anti-Semitism,” it matters not who made the threats, only that the threats were made against Jewish institutions, using hateful language. In using the term “attacks,” it matters not that the threats were all hoaxes (thank God! ), only that the threats produced mass evacuations. For now, it matters not why these attacks were made, only that the arrest means they may stop. Let me be clear: what matters is about us. It was always about us. Were we prepared for a bomb threat from anyone? Yes. Were we secure enough in our relationship with law enforcement to trust them to provide protection, to help clear our building when threatened, and to investigate threats against us? Yes, and, frankly, in our specific instance local and regional law enforcement were actively here for us working, advising, and strategizing with us, and empowering national and international authorities in a way that lead to the arrest. Were we surrounded by neighbors and community leaders who showed love and support for us? Most emphatically, yes! Did we also go through an emotional rollercoaster ride? Yes. Hold onto that for a moment. This period was difficult for us. It pulled us away from routine and from our goals, like the spring play. The number and sophistication of the threats raised the specter of Jews being unwelcome in countries they have come to call home. After the first threat, I wrote elsewhere that I was not afraid and believe Judaism teaches us not to be afraid. Resilience, defiance, anger, in addition to fear are no easier to handle. We went through a very tough time; we should not forget that. Our long-term memory, though, needs to be different than our short-term memory. We quickly forget the many smaller, isolated acts of anti-Semitism every year. Our long-term memory reminds us to be vigilant; that is where our plans in case of a threat originated. Our long-term memory also needs to be positive. We never taught our students about hatred. We never taught our students about insecurity. We taught them about uncertainty and about community. We taught them about living and love. We also rehearsed, reworked, and refined an amazing play. The play is about friendship, it is about the unique value of everyone, and it is about promises of security (like Noah’s rainbow). In the long-term, I am confident that our students will far more remember what they learned by doing the play; lessons about courage, poise, confidence, and the thrill of success. We taught strengths, strengths that will endure. This week, Jews finish reading the Book of Exodus, Shemot. Each time we finish a book of the Torah, we sing the words “chazak chazak v’nitchazek” (be strong, be strong, and you will be strengthened). As we emerge from a challenging winter, let us go from strength to strength. By focusing on enduring strengths, we will be strengthened. As a Head of School, it is my job to find the words. It is my job to remind everyone what should already be evident and to teach it to those first encountering us. I have other significant roles; this one, though, is one I cherish. I cherish the chance to articulate the school’s values because Albert Einstein Academy is not just school; it is an investment. As a school, we are being asked to articulate our core beliefs as part of our re-accreditation process. Our core beliefs encompass much more, though, than our school; our core beliefs establish what we do for the community. Core beliefs are more than mission; they pave the way to mission fulfillment. We have a stated mission to set our sights in a particular direction; it is like our Torah. 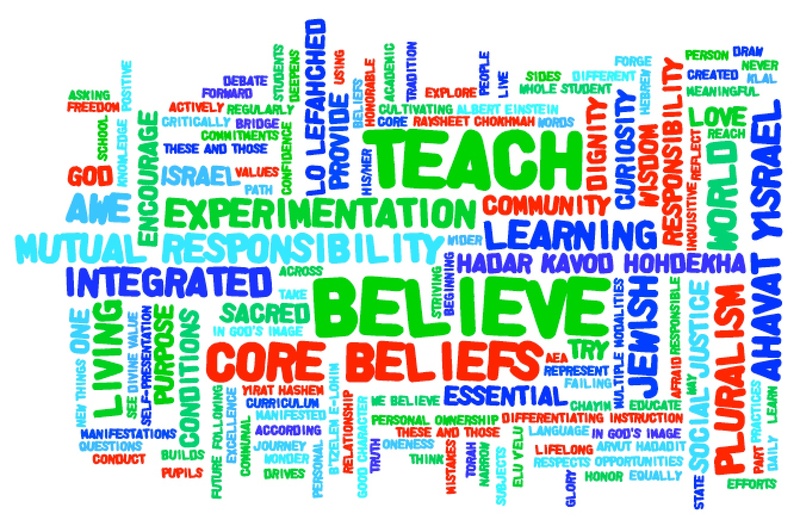 To know how we achieve our mission and why we choose certain paths, we need a “Mishnah,” of core beliefs. Below, please find a draft of AEA’s Core Beliefs. This draft reflects feedback from the faculty, staff, and the board of directors. It is still a draft. I welcome your feedback, too, positive or negative, grammatical or philosophical. The list incorporates many Jewish ideas and teachings. Each belief has a consequence for what we do. Taken together, the list also demonstrates how AEA goes beyond a K-5 schooling. We are what we believe, particularly when belief is put into action. Our statement of core beliefs indicates the value-proposition we are making. Our community and our world benefit from students who see value in themselves and others, who seek to understand the world and its differences, who take responsibility with love and without fear, and who bring honor and dignity to what they do. AEA is an incubator for a vibrant, meaningful future for our students, our community, and the world. As an institution, AEA is an investment in that future, may we merit it soon. We believe that each person, having been created in God’s image, has divine value. As such, we educate the whole student, using multiple modalities and differentiating instruction for each according to his/her way. 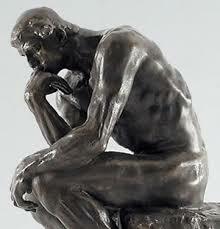 We believe that curiosity manifested in asking questions is the path to wisdom. As such, we encourage our students to see the world with awe and wonder, to be inquisitive, and to think critically. We believe that “these and those,” as sides of a debate, represent equally meaningful manifestations of one living world. As such, our pluralism respects different commitments that reach for one truth, and our academic curriculum is integrated across subjects to reflect that oneness. We believe that we are each responsible for the other. As such, we teach personal and communal responsibility. We regularly explore social justice and freedom as part of responsibility to the wider community. We believe that love of the Jewish tradition drives our efforts. As such, we live Jewish values and practices daily. We teach Hebrew as the language of the Jewish people. We actively forge a positive relationship to Torah and the State of Israel. We believe that living and learning are a lifelong journey. As such, we teach that it is essential to try new things and encourage experimentation. We teach that mistakes are opportunities for learning; failing forward builds confidence and deepens knowledge. We believe our purpose is sacred. As such, we conduct ourselves with honor and dignity by cultivating good character and by striving for excellence. We take and teach personal ownership for our self-presentation, for our learning, for our school, for our community, and for the future. Can you command joy? If by command we mean tell someone to do something, it seems highly unlikely that one could command someone else to feel or show joy. On the other hand, if by command we mean draw full attention, well, perhaps we should investigate what would draw our full attention to feeling and to showing joy. On the festival of Sukkot, we are told V’Samachta b’Chagekha (to be joyous on our holiday). In some sense that is easy. Who isn’t happy to have a holiday (especially if there is no penalty for not working)? Sukkot, though, adds an odd dimension. It’s a holiday when we go out of the comfort of our homes into outdoor huts, usually at the start of the rainy season. Autumn may be beautiful, but it can sure be cold, dark, and dreary. Where is the joy in that? Monday’s Albert Einstein Academy Jewish Day School all-school field trip to HersheyPark for Chol HaMoed Sukkot Day offers an answer. Tablet Magazine’s article “A Holiday Pilgrimage to an Amusement Park” explains more about the day itself. Our trip, though, was all about getting out of our usual routine for a long day in the dreary mist, all in the name of joy. It is fun to ride rollercoasters and smaller rides at an amusement park. 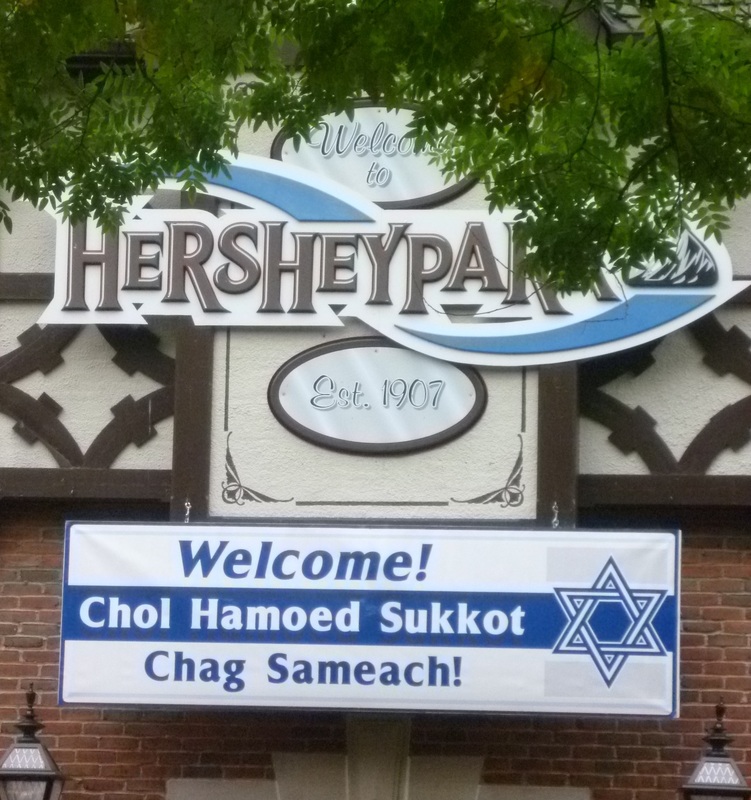 It is super-sweet to tour the Hershey’s Chocolate World factory tour and get a sample of their candy; Hershey is “the sweetest place on earth.” It is also incredibly empowering to be somewhere secular and to have only kosher food available, with sukkot set up nearby to eat it in! Monday, our whole school felt the joy of marking a Jewish holiday among a Jewish majority. Even if we were a different Jewish community than ones at HersheyPark who came from ultra-Orthodox enclaves, we were part of a larger community doing the same thing, each in our own way. That’s what Sukkot is supposed to help us achieve theologically, too. The draw of our full attention to joy comes from shifting our focus away from the material and instead toward the divine. We notice nature, we feel the fall season, we make extra blessings, and we focus on hope. We hope for rain in its season, we hope for redemption, and we hope for joy. What commands our joy is drawing our full attention to the fact that we are a purposeful part of Creation. Autumn will turn to winter, AND spring will come. To remind us the fullness of Creation, Sukkot ends with two holidays. Shemini Atzeret is understood as one-on-one time for God and Israel. It allows for us to enter Simchat Torah with a sense of completion and at-one-ness. So it is, that on Simchat Torah we finish reading the Torah and immediately start again at the beginning. Our words mirror nature. Our souls aligned to cycle through another year of living. Done right, there is much to celebrate! On this coming Monday, the will unroll a new paper Torah, donated by the graduating class of 2013. Our students will see the fullness of the text. 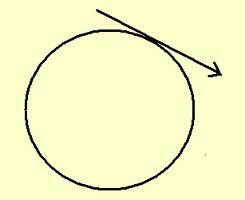 We open it in a circle to emphasize the cyclical nature of the reading and of life. It is a joy to see the students’ wide eyes as they see it all at once. 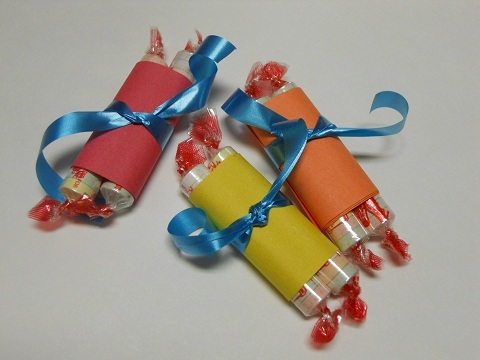 We also sweeten the experience with a sugary treat! May Torah always be sweet on our tongues, may this season give us hope, and may the fullness of our experiences command joy from each of us. Would My Mother Be Proud? I finally did it. I got into Harvard! Seriously. 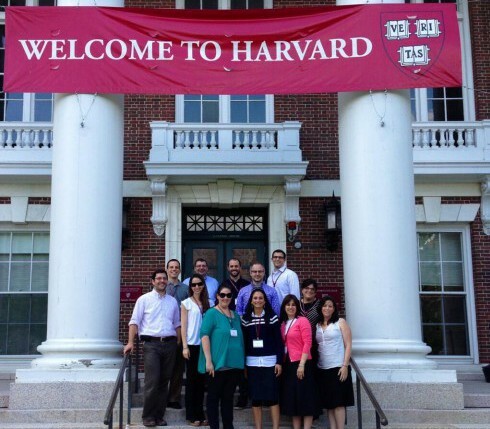 I have been selected to attend Harvard University’s Graduate School of Education Principals’ Center program “Improving Schools: The Art of Leadership” as part of a cohort of Jewish day school leaders who will have additional reflection and mentoring at Harvard with a year-long project afterward, fully-funded by the AVI CHAI Foundation. My mother would be so proud! Or would she? Yes, it is true that my teen summers in the Boston area led to the purchase of some Harvard gear, and that I fancied I might go to Harvard for college. I remember my mother encouraging my enthusiasm and exhibiting a quiet patience. I think she knew that I did not yet know myself well enough to choose the right college campus for me. In the end, I went to Swarthmore College. My mother’s charge to me as I left for Swarthmore was to take four years to learn how to think. Now, I think she would not be proud of me getting into Harvard. She might be happy for me, but she would also wonder what going there would do for my soul. The name Harvard and even the promise of great learning would provoke a stale, “good for you” or “how exciting.” To fire her up, I would need to give a deeper reason for the value of the program. Thankfully, AVI CHAI is providing that deeper reason: I am going to Harvard “to enhance or advance the Judaic mission of” Albert Einstein Academy (AEA). The classes will give me tools for being a better principal; and the mentoring and reflection will push me to become a better person and thereby a better leader. I am going to Harvard not just to learn how to do but also to learn how to be. Of that, my mother would be proud. This Sunday is Mother’s Day. I miss my mother dearly. In her absence, I have come to appreciate how mothers (not exclusively, yet still significantly) are the grounding presence in children’s lives. Children learn from mothers that our origins, our history, our family, our roots, and our values are key to understanding who we are. We need this foundation and to recognize it. One of the gifts of a Jewish day school education in the elementary years, like that of AEA, is precisely the time spent teaching those origins, history, family, roots, and values. A school is not a parent; it cannot be. A school can, however, teach more than tools; it can teach the soul paths towards flourishing. I am going to Harvard to advance that Judaic mission: teaching our students’ souls to develop journeys that lead their whole being to thrive. I thank my mother for getting me on that path. 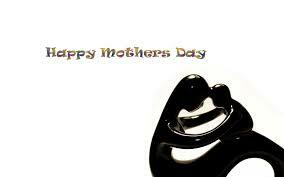 I thank all mothers for giving their children the groundwork for purpose. I hope your children make you proud, and I hope that AEA will help them do it. With the onset of spring this week, our students are a little hot under the collar. Provocations are deemed injustices. Reactions look more like overreactions. Reconciliation comes grudgingly. That obsession with fairness, though, is what makes this time in their lives so powerful. This week, I also reached my personal fundraising goal for St. Baldrick’s as a participant in 36 Rabbis Shave for the Brave. Together, this group of rabbis has already surpassed two goals, raising over $450,000 collectively for pediatric cancer research, a woefully underfunded area of medical science. I thank those who made a donation to support my participation. Their generosity means that I need to act on my promise to shave my head; that need meant that I had to let my students know the shave was coming and why. I found a way to bring school culture, the curriculum, and my shave together in a way that I believe speaks to the values of our school. 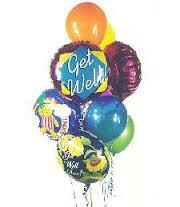 Those squabbles became the point of comparison to real challenges and losses. The curriculum includes study of the weekly Torah portion; Shemini (Leviticus 9:1-11:47) outlines some laws of kashrut (Jewish dietary law) and poignantly recounts the strange death of two of the High Priest Aaron’s sons, Nadav and Avihu. I started my explanation to them by wearing my bright blue, curly-hair wig from crazy hair day last week. 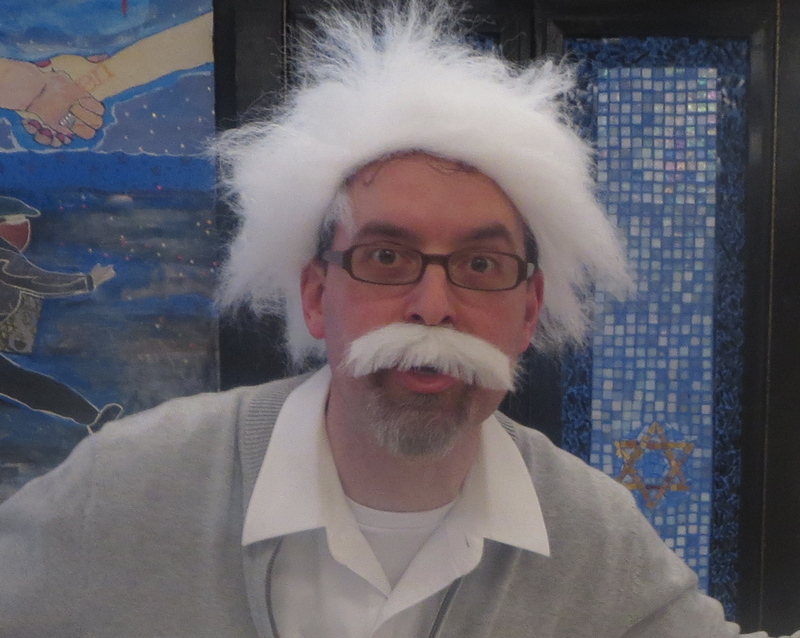 I mentioned that I noticed this week’s “spring fever.” Then, I donned my Albert Einstein wig to talk ask about their learning. It is a striking lesson then that, in the face of true injustice, we find a key Jewish figure responding very differently. In this week’s Torah portion, Shemini, two of the High Priest Aaron’s sons—Nadav and Avihu—get killed instantly by a fire that breaks forth from the altar. While many commentaries seek to explain how the victims were at fault, Aaron’s reaction is unapologetic. Aaron does not fly off the handle; he does not lash out at others; he places no blame; he files no complaint; he is silent. Aaron’s silence is not just the absence of making noise. The Hebrew word for Aaron’s silence Dohm is different from Sheket. Sheket is quiet, calm silence; dohm is still, inanimate silence. Aaron’s silence is the kind you can hear; it is the total absence of what should be there. In the face of the random death of own children, Aaron temporarily absents himself. Each time we encounter something wrong in our world, we have a choice. We can complain, we can be silent, or we can try to do something.
. . . then I told them the big news . . . I told them that in three weeks, I will be shaving my head. . . . I have my own reasons for having felt absented, like Aaron, by cancer; I have also “yelled” publically at God. To teach our students a different way to respond to injustices, I will actively show how we can become change agents; I certainly will not be able to hide my bald head. The educational moment was there, so I seized it. I encouraged them to think about all the times they might whine or complain and all the times they shut down. I told them I that I don’t want them to shave their heads; I hope they never have cause to do so. 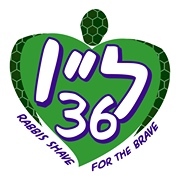 Instead, I asked them to try to be present in our imperfect world and to try to fix it.
. . . [36 Rabbis Shave for the Brave] . . . refers to the Jewish idea that, at all times, 36 righteous individuals sustain our world. We cannot know who those people are, yet we can try to live up to their image. I believe that, as rabbis, this effort is about more than funding the fight against cancer, though; this effort is about taking productive action in a broken world. As we move from Purim’s story of Esther saving the Jews in Persia to Passover’s story of God’s redemption of the Israelites from slavery, we need to find our way to a better world. I ended the conversation with the uplifting message of the Passover Exodus and the Passover seder’s concluding hope that we celebrate freedom “next year in Jerusalem” with a video showing today’s Jerusalem in the eyes of American high school students studying there. 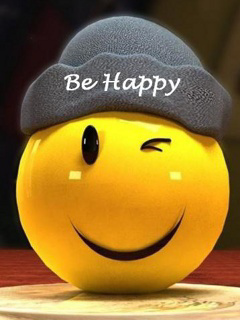 Indeed, our troubled world can be happy. I know I am not done explaining. While most of the rabbis will shave on April 1st at the Central Conference of American Rabbis convention, I will be waiting for a local event, “Pasta & Pediatrics” at the Siegel JCC on April 13th. When I shave, it will be very close to Passover. Closer to that time, I will teach about the mourning customs of the Omer, the period of counting from the second night of Passover to Shavuot. For now, though, I am finding my way away from complaining, out of silence, to action. I hope my students and you, too, will do the same in your own ways. You have 8 minutes: You must talk the entire time, even if you are repeating the word “um” to fill time. You have 8 topics: you must address at least 1 and can talk about all 8. You have a partner: your partner can only listen, with as little reaction, verbal or physical, as possible. After your 8 minutes, you will switch. Thus begins The Great 8. The topics are heavy and may include: God, Romantic Relationships, Finances, Parents, Addiction, Career, Body Image, Roommates, Fear, Crutch, etc.. Talking about them without a response from a real listener is like having a sounding board that only gives back exactly what you say. Not reacting forces the listener to hear everything being said without having to think of responses. The debrief of the experience brings out these lessons and so much more. The end result of this exercise taught by Rabbi Lauren Holtzblatt to a UD Hillel intern who taught it to me? 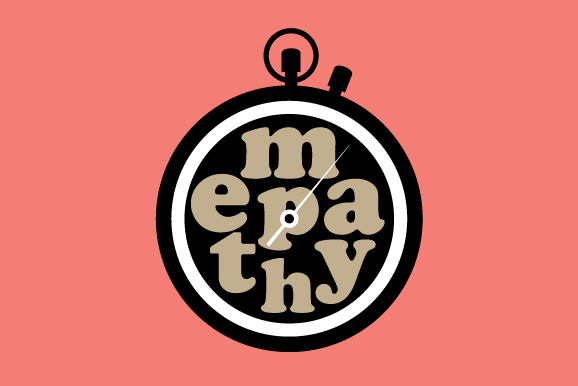 A significant life skill that is otherwise hard to teach–empathy. 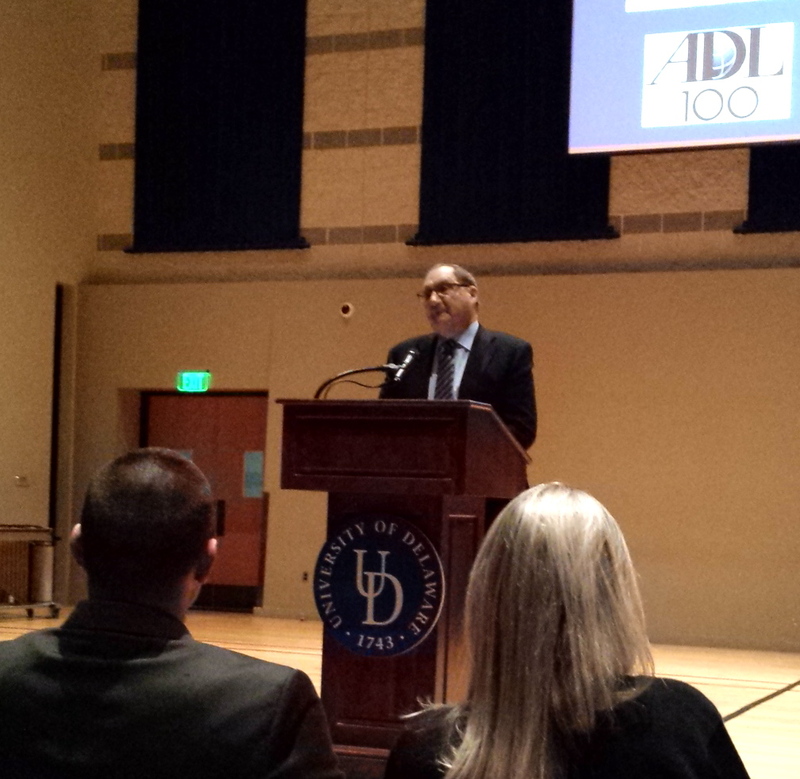 This week, two triggers reminded me of the importance of teaching empathy and my favorite exercise for doing so, the Great 8: one, listening to the Anti-Defamation League’s president Abe Foxman at the Kristol Hillel Center’s 20th Anniversary Celebration at the University of Delaware; and two, listening to the abridged version of The Explosive Child: A New Approach for Understanding and Parenting Easily Frustrated and Chronically Inflexible Children by Ross W. Greene. In each case, empathy was identified as the key to communication and change. Mr. Foxman spoke of the need for empathy as the driver for outrage and for communal responses to hate. Without taking sides politically, our empathy should drive us to outrage over the lives lost in Syria and elsewhere. In response to the vandalism at the Islamic Society of Delaware, our empathy drove an interfaith gathering at the very same time Foxman was speaking. Empathy helps us value life and to work together. 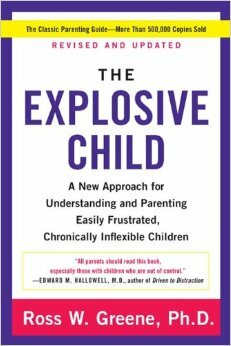 Dr. Greene’s book posits that we will be able to teach flexibility to resistant children by offering an “empathy step” in response to problems. If authority backfires and the problem can’t be let go, we must engage the child in problem solving. To do so, he advises opening a conversation in which you accept that you may not know the real problem and you do not have the only answer. Open inquiry and neutral drilling for information demonstrate empathy so that the child can and will work with you to address your concerns and his/her own. I have already used this method at AEA with positive results. If you knew that someone really wanted to hear your deepest concerns, you might open up more. If you had practice speaking about serious issues with someone really listening, you might discover more about yourself. The listener certainly will understand you better. In today’s world, feeling that kind of connection, whether we offer it or receive it, is all too rare. Try empathy on for size, by doing so, you will learn and teach it. It may be hard, and often it is. The results, though, may change your world. It can take just 8 Great minutes.